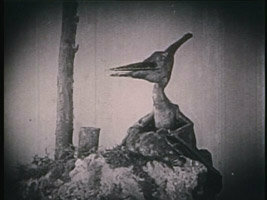 Pteranondon from the 1925 film of Arther Conan Doyle's The Lost World. Pterosaurs have been around in popular fiction in all kinds of different media almost as long as the dinosaurs. In many ways they have always been in the shadows of their more illustrious cousins, but despite this have repeatedly been represented in all manner of books, films, comics and TV shows over the years. One notable feature of these various appearances are the hugely limited number of species on display. 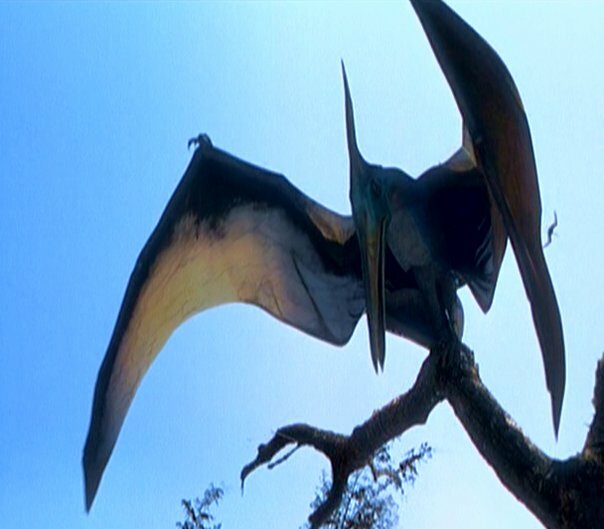 While dinosaurs of all kinds abound (Tyrannosaurs, Diplodocus, Triceratops, Stegosaurus and now Velociraptor seem to make it into every film), the only pterosaurs we ever see are Pteranodon and the occasional Rhamphorhynchus. To make matters worse (for me anyway) the reconstructions are often very poor and rely on outdated ideas about pterosaurs. One can hardly complain about the early films and books, but dinosaurs on the big screen especially have changed dramatically several times over the years reflecting the latest (well relatively recent) ideas in palaeontology, yet the pterosaurs stay the same. Pterosaur research has been no less intense that that on the dinosaurs and our ideas about how they lived have changed as we discover new fossils and new ways of analysing them, but we are left with tooth-y Pteranodons, ‘pterodactyls’, and 5 meter wing-span rhamphorhynchoids! This section is not meant as a nit-pick of every pterosaur that has ever made it into print or film (if it did, this would be a very big page!) but an attempt to look at some of the various incarnations of pterosaurs over the years and how they reflect our changing knowledge of them through our research. 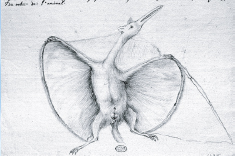 Jean Harmann's 1800 restoration of Pterodactylus. Drawing of the Pterodactylus models from London's great Crystal Palace exhibition. The first reconstruction of a pterosaur as a living animal (rather than just a skeleton) was way way back in 1800 by the Frenchman Jean Harmann. The public did not actually see this drawing as it was passed between two scientists, but in many ways it was quite accurate. The pterosaur (a Pterodactylus – at the time the only pterosaur known) was portrayed as having almost circular wings and was covered in fur. Clearly Harmann thought it was a mammal, but it did at least stick closely to what was known about the skeleton. 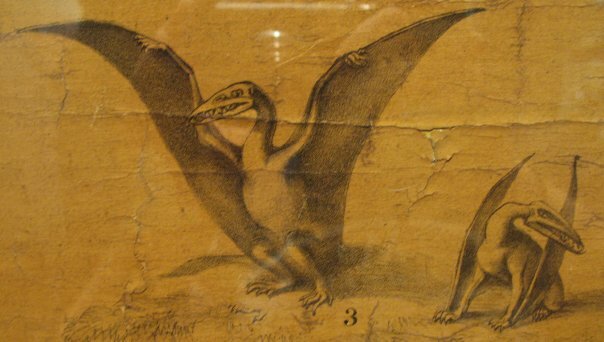 The public first got to grips with pterosaurs in the mid 1800s with a number of reconstructions circulating in the scientific literature of the time and either being seen by the public, or copies made by artists for various popular books and articles. Most ‘famous’ of these was Newman’s flying possums. Undaunted by the famous Baron Cuvier’s assertions that these were reptiles (and a fair few other eminent scientists too) he doggedly depicted them as small furry insectivores that frankly did not even match the skeletons so were hard to take seriously even then. However, there were plenty of more realistic efforts from artists working from the advice of famous palaeontologists such as William Buckland and Richard Owen. The latter inspired the first known models of pterosaurs, constructed by W.B. Hawkins for the Crystal Palace exhibition in London in 1853. Other portrayals of the time showed small pterosaurs (generally rhamphorhynchoids) clinging to cliff faces or gliding over seas as marine reptiles waged war on each other. Other made the first of a long-running mistake – the assumption that a membrane for a wing would require support and thus bat-like fingers. These bat-wings are a reccuring theme in pterosaur reconstructions and they still turn up even today (very occasionally) by those who have not bothered to check a skeleton or any scientific research. Pterosaurs made what was probably their first appearance in fiction in Arthur Conan Doyle’s 1912 masterpiece – The Lost World. Doyle was actually a keen amateur scientist and despite the obvious dramatization of his work was actually an accurate representation of pterosaurs at the time. From there they moved quickly to film with the 1925 version of the book featuring a Pteranodon, though it retained the name of ‘pterodactyl’. 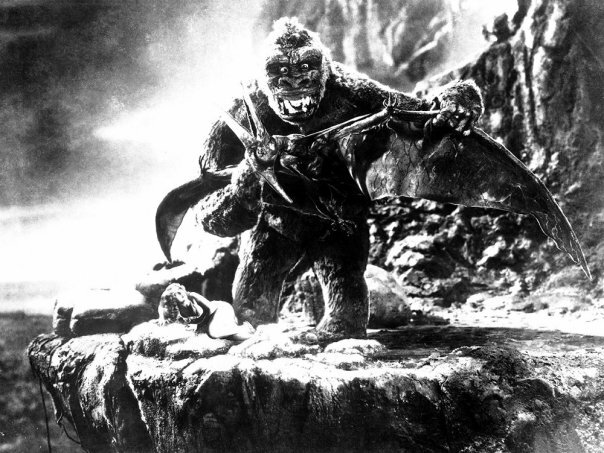 Pterosaurs continued to make regular appearances on the big screen, perhaps most famously with a Pteranodon having a rather terminal encounter with King Kong in 1933 although they were replaced in the recent remake with giant bats. Next up was the famous One Million Years B.C. from 1966 that saw a giant Rhamphorhynchus and Pteranodon battle over Raquel Welsh. Sadly both showed the classic ‘bat-wings’ though in the defence of legendary animator Ray Harrhausen, the wings fell apart without the extra support! Another huge rhamp made a brief appaearnace in the Land that Time Forgot 1975, but it was not until Jurassic Park III in 2001 that they made a serious comeback (after a cameo in the second film). Unfortunately despite the advances in pterosaur research, we were left with a Pteranodon that displayed none of our new understanding and featured several huge lapses. Poor reconstructions are one thing, but a film with this budget and level of expertise should not leave us with a Pteranodon with teeth! The name means ‘toothless wing’!!! These pterosaurs also had the wrong tail, had nesting behaviour at odds with what we knew then (and certainly know now) and had ‘slack’ wings that could not have borne them in flight (if the membranes were not tight, they could not have functioned as aerofoils). Returning to literature, pterosaurs of a sort made numerous appearances in Edgar Rice Burrows ‘Pellucidar’ series of books which began in 1914. Here a race of winged (and flying) humans bear more than a passing resemblance to pterosaurs with elongate fingers supporting a flight membrane and with long, rudder-tipped tails. Oddly enough this idea was mimicked (or copied) in the X-Men comics with the human-pterosaur Sauron making his first appearance way back in 1969! 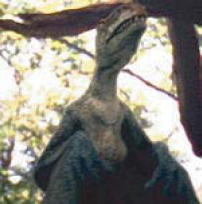 Of more notice was the genus Ceradactylus making its presence felt in the original Jurassic Park novel in 1990 by attacking the lost visitors in the ‘aviary’. Although still somewhat contentious at the time, Michael Crichton had them walking quadrupedally, though he hedged his bets by having them hang by their feet from the roof of the cage too. Appearances on TV (in the UK at least) have been infrequent at best. The legendary Dr Who had an encounter with numerous beasts in the ‘Invasion of the Dinosaurs’ story in 1973 where at one point he faced a small flock of highly unconvincing ‘pterodactyls’. To my knowledge the next serious appearance was ‘Primeval’ in 2007! This featured the best and worst of pterosaur science – a beautiful Pteranodon that for me was far better than the Jurassic Park effort, and then, oh, an Anurognathus. Now what little we know about Anurognathus is that it was very small, quadrupedal, hunted insects at dusk or night and lived in the Jurassic of Germany. So to discover that it was a large, diurnal, bipedal carnivore from the Late Cretaceous of the USA was a bit of a shock! Believe it or not, I don’t mind too much about ‘dramatic license’ for fiction. My problem is when it is dressed up as scientific accuracy. There are a dozen pterosaurs that would have fitted the profile for what they wanted, so how on earth did they end up with Anurognathus? While the public‘s perceptions of dinosaurs have undergone a new synthesis with people happy to accept small, fast, intelligent and especially feathered dinosaurs. However, to many, ‘pterodactyls‘ are still seen as being large, leathery winged, gliding reptiles. However, despite some of the artistic crimes perpetuated against pterosaurs, there is hope. More recent reconstructions - most importantly led by pterosaur, not dinosaur experts - are starting to come to the fore and in greater numbers. Still, more effort is required to convince the public about the worth of these wonderful flying beasts so do demand your proper ptero-fun the next time you see another dodgy pterosaur on the screen. I have attempted to find out who owns the copyright to the images presented here, without success. Should the owners find them and wish them to be taken down, please contact us and they will be removed. However, we would ask that since this site is non-profit and exists solely for education we would be most grateful if permission was granted for their continual usage.